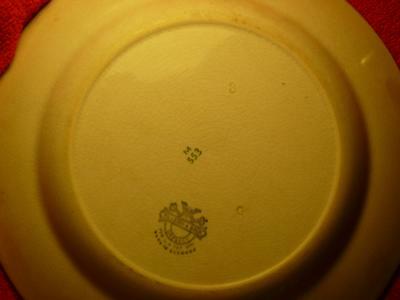 A Real or Fake Villeroy & Boch Pottery Mark? 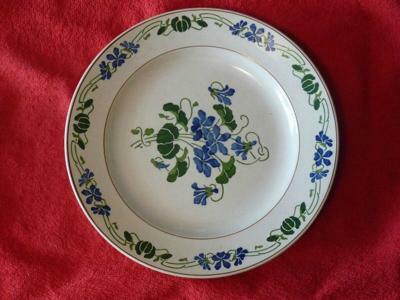 :- I have a Villeroy & Boch dinner plate that I'm curious about. Is it genuine and if so what would be the date of manufacture. After looking at loads of V & B logos I cannot find one like the one I have. Also if anyone knows what is the pattern called. Thank you for your time. Pictures enclosed include the front, full back, logo closeup and a GF with M below impression. Actually, when you study the Villeroy & Boch marks, of this type (Mercury), they vary quite a lot. In other words there are several different versions. I have never actually seen this one before, but remember, they had their head office in Dresden for a long period - and the Saar region was seeded to France after the war, then voted itself back into Germany in 1957. So lots of confusion there for poor old V & B, one of the oldest surviving a very best firms ever to grace planet earth (in my humble opinion). and black. V & B are known for marking their wares with characteristic German efficiency and precision. However, there are many variations, as I say and not all are fully understood or cataloged. The big picture is that of faking. I can't see any reason why someone would particularly want to go to the trouble of wanting to fake a V & B mark on such a standard plate and pattern. Not that it's not very nice (very art nouveau looking), but it's not as if it's a an imperial vase from the Ming court. What would anyone seek to gain from this type of faking? It is the fodder of ordinary supply distribution, not a 'valuable' item as such. Don't get me wrong, Villeroy & Boch are renowned for their award winning initiatives in design and quality of make, being the standard-bearers for forward thinking businesses for the past 200 years or so. And I am not saying V&B services are not worth good money at auction, but I can't see any particular commercial advantage to faking a plate of this bulk standard nature. However, I am always open to be re-educated by someone who knows about the infamous fake V & B trade. 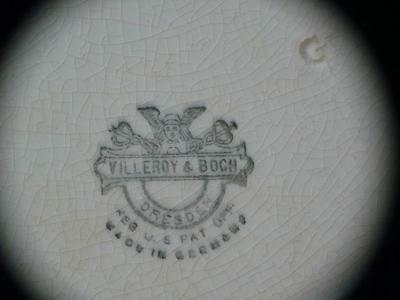 Comments for A Real or Fake Villeroy & Boch Pottery Mark? Your Mercury Mark is dated 1874 to 1909. This is a valuable plate because of its scarsity! 1945. Sadly,all of the rcords were lost in the devastation. a 68 piece dinner service that I have. He has offered to look for the pattern name for you with the records office in Germany. could then proceed, if you are in agreement. Many thanks for this very kind offer, Sandy. Please could you be so kind as to post any results and findings here on this site. Just have to step in as moderator at this point. ...with reference to the term "made in Germany" not being used before 1935 I am not sure is correct. Firstly the comment was rather rude and abrupt - something not welcome in these forums. Secondly, they left no name, so, again, anonymous comment is not welcome. Neither is blanket quotes with no references or citations to prove or back up what they are saying. Third, as I say, I'm not at all sure the statement is correct. I am no expert on Villeroy & Boch marks, so straight away I looked through my German marks book Rontgen's. We know that Rontgen isn't always 100% correct, but we'll cut him some slack due to the vast amount of useful material catalogued. He makes no mention of this 'made in Germany' date of 1935 for V&B Dresden output. I checked www.porcelainmarksandmore.com and straight away saw the use of the 'made in Germany' mark (at least on Mettlach wares) on a mark patented in 1913. This would make total sense as it would have been in accordance with the import laws of both the USA and UK of the time. There is no reason why the Dresden factory of V&B, which was acquired in 1856, would not have used the 'made in Germany' from the late 19th century also. As I say, I don't have any hard evidence of this, it's just common sense. I would have to see proof positive of this strange 1935 date to change my mind. If a commenter makes sweeping statement, please back it up with a bit of further detail or evidence or references, so we can all share in the knowledge. And please don't be anonymous when you make such a comment. Villeroy & Bock. Pottery Mark. Villeroy & Boch ceramic bowl. Do people who are interested in VB Dresden know that Robert Heron from Kirkaldy in Fife, Scotland, brought six decorators back with him to his pottery (Robert Heron and Son)in and around 1882. He was visiting Dresden and noticed VB's white ware with fruit and leaves and also chickens on it with green banding on the rims and lured the decorators away to produce a very similar line in Kirkaldy. The Scottish ware was supported by Lady Grosvenor and the company named it after her family castle at Wemyss, thus Wemyss ware came into existence. Karl Necola, a Bohemian, was the only one of the six to stay in Kirkaldy as he married in the town. The others returned to Germany after a short period. Does anyone know when the VB fruit and chicken decoration started in Dresden? I have a rectangular bowl with the same mark, the only difference are the marked letters, I see only a G and I can see what seems to be the "G" plus an "E" or "F"and a "J" overlapped, the G and the J have the same depth, the E is not so deep., my pattern is all in blue and has some differences with yours, in the back it has 508 M in blue. At least we both have the same Mercury seal, I´m almost sure that this piece has been in my family since 1950, but if anyone else has some more information I also would appreciate it. 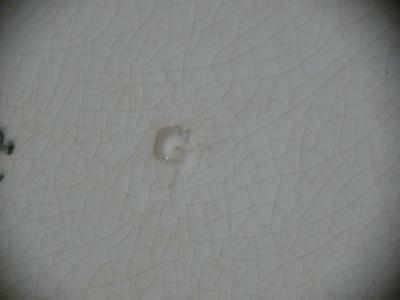 Real or fake villeroy and bosh pottery mark? Mostly in Key West or St.Auustine Florida. I love my bits of pottery.Imagine some as old as the 1600 's. You have solved another part of the puzzle.So much fun! I have a small (about 2.5" high) pottery pitcher, possibly earthenware, with a V&B Dresden Made in Germany mark on the bottom. I haven't found a match to the mark; it has the Mercury crest but the band with DRESDEN in it on the bottom is plain (no embellishments on it above MADE IN GERMANY. It is sort of a cream color with three bands of blue stripes (3 stripes per band, close together) and about 1/2" between the bands. Bands are raised. Can anyone tell me anything about this piece and its value? Not sure how Sandy got on with her research. It's been a while now and perhaps you might have some news, if still following here. The strange thing to think is that the WW2 bombings are still effecting us so sharply today. There are very few definitive listings on this Dresden mark as to where, how and why it was used. All official records gone. Unless Sandy can unearth more in her sleuthing. I am looking for some expertise. We are a small historic house museum and someone has offered a donation of a small Villeroy & Boch teapot. It is a pretty piece and would look very nice in a china cabinet but I want to make sure it is from our period before I accept it. I have researched the maker's mark as best I can, and it is similar to the stamp of 1874-1909, but in gold/brown colored text, and Dresden instead of Mettlach. Also, I have seen the pattern identified as Copenhagen but this teapot has a smooth surface instead of a ridged one. Our house was built in 1901 and is the home of Fort Lauderdale founders Frank and Ivy Stranahan. Generally, we interpret the time period of 1900 to 1920, so if 1874 to 1909 is correct, it would fit in nicely. Anything much later would not. Would you be able to help me confirm the time period and pattern? Lovely! My understanding is this Dresden version of the mark is from 1874- 1909, so you are good. I have not come across any evidence to contradict this. Thanks for the enquiry. With your permission, I will add your pics to the thread. "Made in Germany" was added due to the British "Mark of Merchant" law of 1887. From what I have gathered from several sources, the Mercury mark was used from 1874-1909 ONLY. Therefore, if the Mercury Mark variation has "Made in Germany" added to the backstamp then it must have been manufactured sometime between 1887 and 1909. I have a similar Dresden mark, minus the text underneath, on a Jugendstil ceramic tray. The mark is in brown, with 2449A underneath. For different reasons - in this case the lack of an obvious collectors' market - I think it's unlikely to be a fake. Help me, please! I’ve bought 2 white soup tureens from a person who was selling only V&B ware, but home I saw that on one of my tureens there wasn’t any mark. Can it be possible to be a Villeroy & Boch product without mark? I have a very large pitcher that is hallmarked with a picture of a house with a colinder standing in front of it. Can you tell me what period this is from? You have a real v&b article. It was made in Dresden Germany. There should be a code that easy enough to figure out the year one example I’ve seen on early 1900,s were as follows (190). 5 this meant it was made in 1905. I hope this has helped in some small way. I cannot make out the Other mark but it appears to be something like.....Riwmmb??? It consists of a ceramic tray, four (shot cups/egg cups)? and a large decanter with a cork sealed stopper. It is hand painted,with flowers,love hearts and the decanter has a man and woman arm in arm ? Wedding/Anniversary or Valentines theme?? I have searched soo many sites to place this item. I have photograph's, although I'm unsure how to upload them on here?